Both the passenger and pilot were declared dead. In Fort Lauderdale, Florida, It was announced that a New Jersey Pilot and the passenger had died when their small Cessna 335 had crashed into a therapy centre that was reportedly for autistic children. 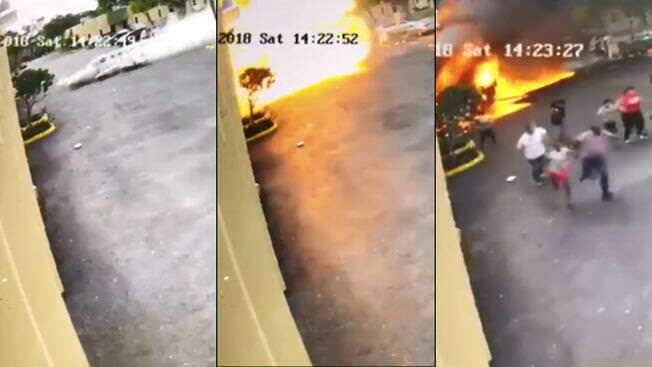 The crash had occurred on Saturday Afternoon located not too far from Fort Lauderdale Executive Airport, which had caused a fire in the building. 51 Year Old Pilot Eladio Marquez in New Jersey who was a flight instructor in his hometown and was registered in New Jersey where he had also owned the plane. After takeoff, it was declared an emergency over the radio “We got a fire in the left engine, turning right back.” Then seconds later he was losing power in his left engine. All five children and eight instructors had escaped the massive fire. It was stated that on Monday Morning, a crane was lifting the aircraft wreckage onto a Flatbed Truck so it was able to be taken away. In other words, the company inside of the warehouse are looking for a new location temporarily till all the wreckage has been removed. Also, the NTSB (National Transportation Safety Board) is looking into this aircraft crash. what do you think the cause of the crash is? i think it's an engine failure, ngl. Oh my god, thoughts go out the families and friends of the victims. This is absolutely tragic, my thoughts go out to the families affected. Hopefully they find out the cause quickly just to move towards some sort of closure.